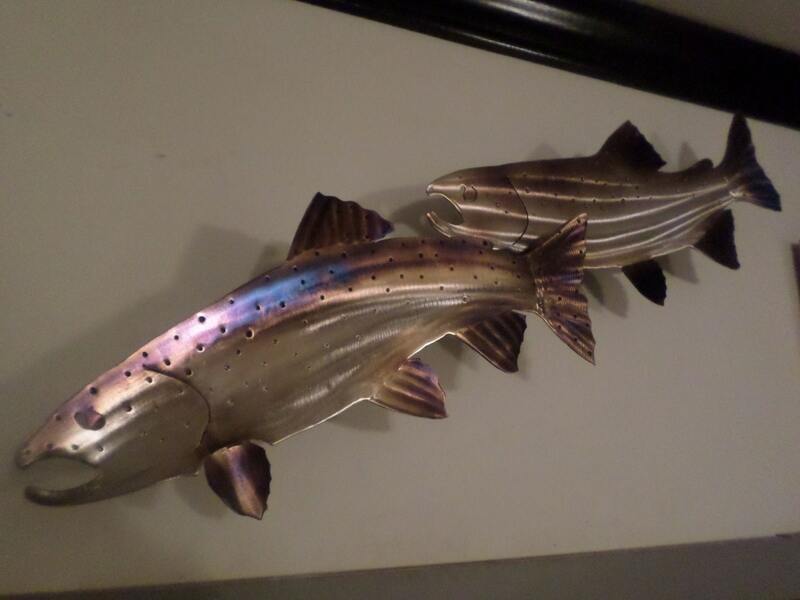 This is a beautiful one of a kind Set of Hand-made,Free Hand-cut,Heat treated/Torch colored Steel-head/Trout.They are 18'' long and almost 8'' wide. 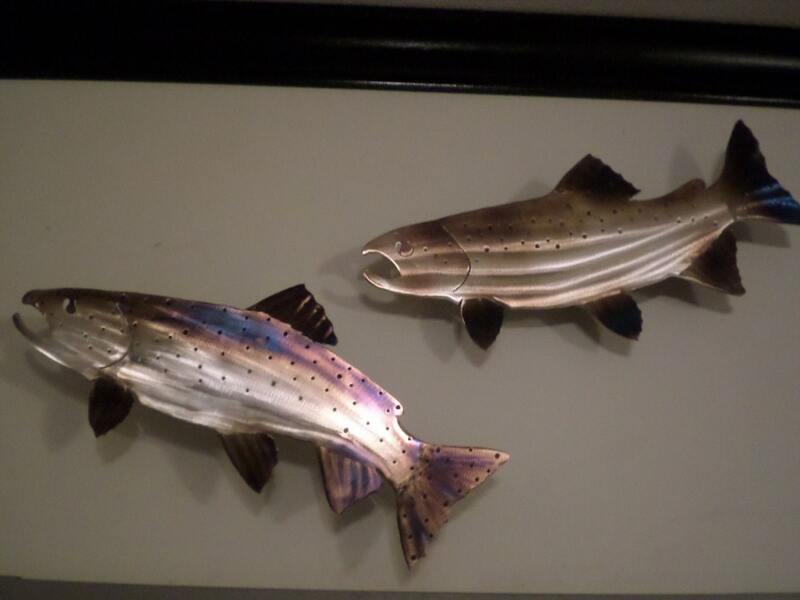 One Fish is mounted 3" off the wall and the other is mounted 4" off the wall.That give's them a staggered affect.I also include an extra 2" bracket to play around with and gives you more options. 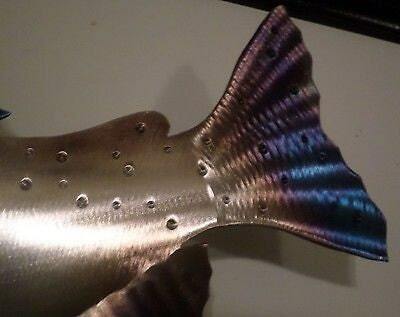 Each fish has a stud welded on the back.So they can be spun around 360 degrees. After the brackets are attached to the wall you attach the fish to the bracket with a supplied fasteners. You get them at the angle you want and tighten it down. 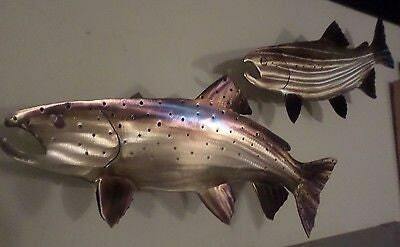 These fish are hand crafted out of High quality 16 Gauge American steel. (Not flimsy metal) Each piece is cut out 100% by Hand. Then ground down,hand filed,polished and detailed. Then they go to my wife where she works her magic with the torch. That gives them the colors and the depth and that three dimensional look that truly makes them one of a kind. These fish are intended for indoor use. Outdoor options available message me to find out more. If you would like a different spacing off the wall. That's no problem. Let me know and I will build the bracket's you need. These sets are made to order. And will ship in 5 days or less.I do my best to get them out as soon as possible.I will not cut corners. I take pride in my work. And give you the best product possible.If i wouldn't hang them in my friends or family's house. I won't send them to yours. 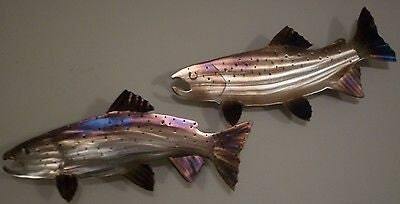 I can make them in any color combination of the other fish I have listed.Or any of the heat treated/ torched colors Gold's,Purple's,Blue's. I can also make 3 fish sets. Additional cost for third fish. Please understand my metal work is 100% Hand-made and Free hand-cut one at a time. Theres no Cnc or computers in our shop. There will be little differences in each one we make. This metal work is Heat treated/Torched for color. Due to the heat treating process no two will be the same. We feel this makes each one a true original. If you have something you need custom made.Or an item we have in a different size and or color.Just let us know. We would be happy to help.Thanks for looking and Have a good day!! We ship everything USPS Priority Mail Within the U.S . Unless otherwise stated. All designs and Images are property of SC Country Metal Creations and may be subject to copyright.